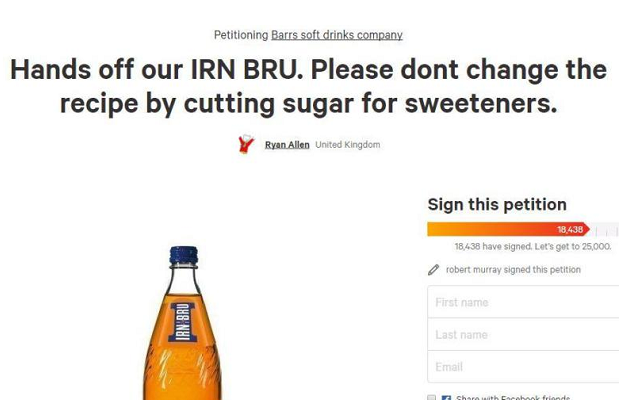 Irn-Bru has been forced to respond to social media storm with week after it was revealed that the soft drink brand was changing its recipe, with the sugar content halved and artificial sweeteners added. When the move was announced, social media went into a frenzy with some fans even stocking up before the new version hits shelves this month. Lover of the soft drink, Ryan Allen described it as a “national treasure” and is behind a petition urging bosses to reverse the decision. Bosses at maker AG Barr have moved to reassure fans that the sugary drink “isn’t changing”. Irn-bru is the most popular soft drink in Scotland, the country of its birth, and the third best selling in the UK. The new flavour will appear on shelves from this month. Will AI create more marketing jobs or less over the next decade? Copyright © 2019 Netimperative - latest digital marketing news.